While some builder grade bathroom fixtures are perfectly good quality, others are lifeless and do nothing to enhance the potential of your bathroom. Sometimes the bland-colored wood and basic title counter tops just don’t convey the image that you imagined displaying to visitors. 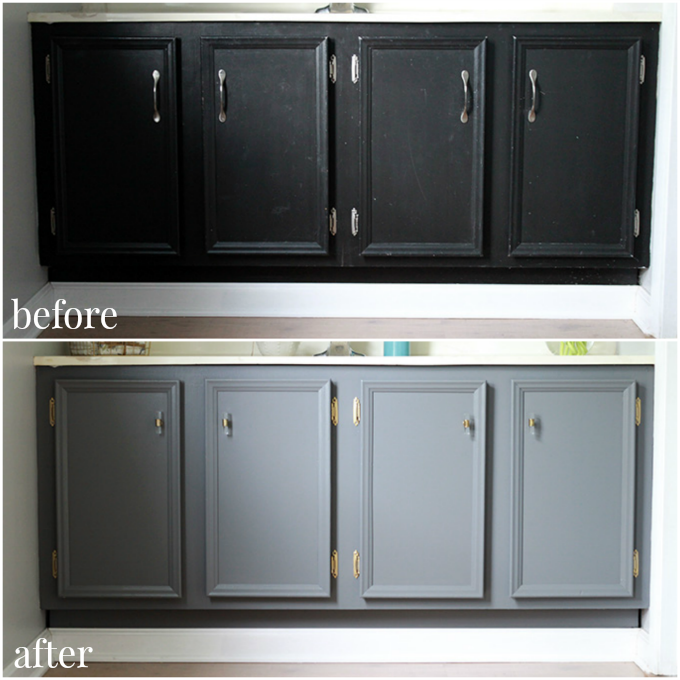 Lucky for you, there are plenty of easy ways to update these dull fixtures without emptying your bank account. 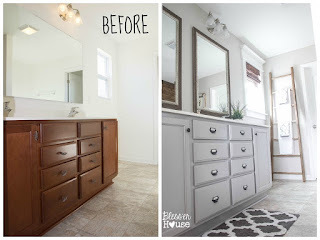 The examples below do a wonderful job of showing that bland can always be transformed into beautiful. This builder grade bathroom remodel included a black vanity that was transformed from plain to extraordinary with just a little bit of gray paint and some golden hinges from Hobby Lobby. Visit Just a Girl and Her Blog to learn more details about this master bathroom makeover. This basic white door was transformed into something incredible with only black paint and a little bit of tape. 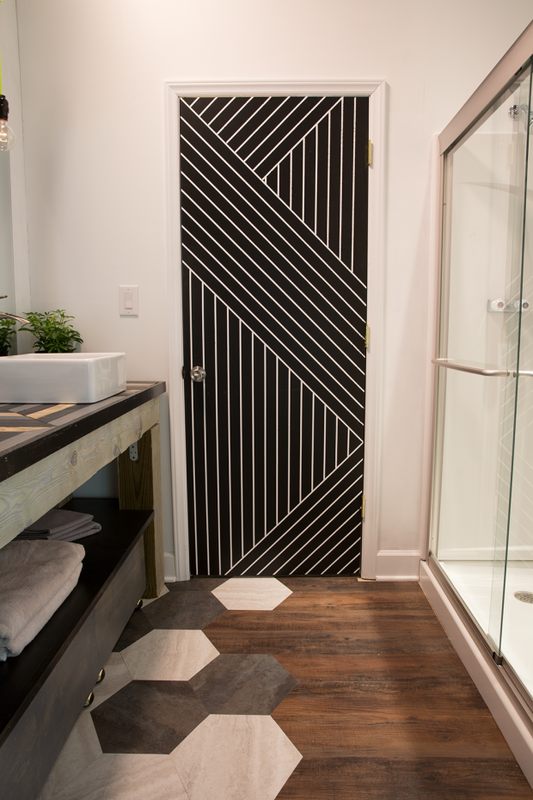 The geometric shapes make a huge difference in the overall look of this bathroom. The hexagon shapes on the door also help liven up a plain wooden floor as well. To learn more about how this builder grade makeover, visit East Coast Creative. This bathroom was converted from builder grade to rustic industrial in this amazing makeover from Blesser House. Wooden cabinets are coated in a brand new color of paint and the ordinary mirror is replaced with driftwood framed mirrors. A ladder was also added as a creative way to hang up hand towels. 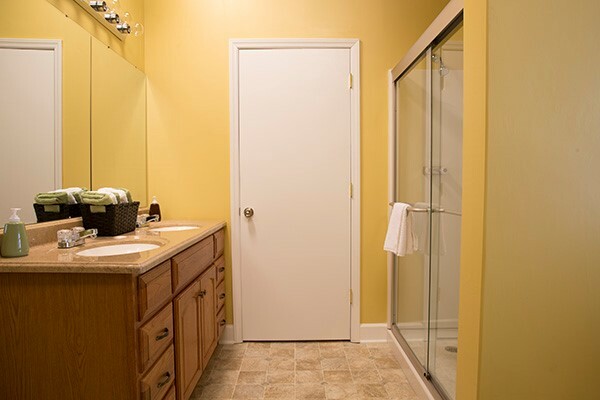 Have you performed a builder grade bathroom update miracle? Let us know in the comments below!